This review is also posted at Elevate Difference. It’s no stretch to say that mainstream media give us a limited range of what women can be, so when we find a book that actually reflects the complexity of womanhood, we’re ecstatic. Make Me A Woman is just that. Readers will be able to readily relate to Vanessa Davis and the daily events of her life, while giving them just enough difference to sink into some pure escapism. 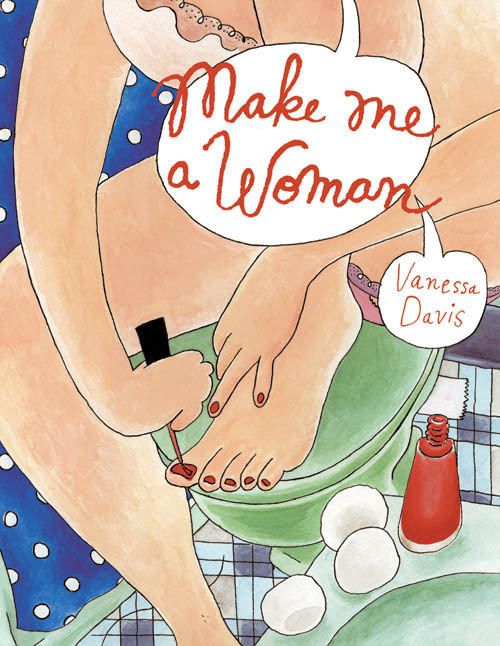 Make Me A Woman is a collection of Davis’s diary comics and drawings from 2004 to 2010. In watercolor, pen and ink or just pencil drawings torn from the pages of her sketchbook, Davis unveils the events of her childhood in South Florida, her life in New York in her early 20s and finally her move to California, where she currently lives with her boyfriend. Davis tackles those seemingly indescribable daily events, be it developing a crush on a stranger in her daily commute or dealing with an awkward sexual encounter or unrequited love, with biting wit and aplomb. All those aspiring artists out there will find this collection inspirational. Davis details her series of low-paying jobs with an eye trained firmly on her career—a paid cartoonist. She also pens a few panels about facing the artist’s worst demon: procrastination. In addition to creating strips about her Jewish identity and hanging out with friends, this autobio cartoonist creates some of her funniest panels about her relationship with her mother and sister. Although Davis’s mother is the űber cool founder of the Palm Beach Jewish Film Festival, she makes her daughters cringe by her mere choice of words, as mothers are wont to do. I’ve read through the collection three times, and each time that I get to the end, I want more. Although her critique of Robert Crumb was worth the price of the book, I still wish that Davis had delved more into her life as a cartoonist. 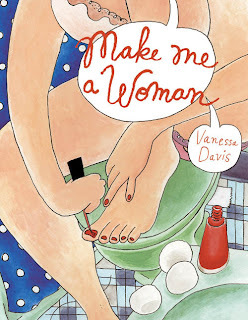 : Make Me A Woman by Vanessa DavisTweet this!